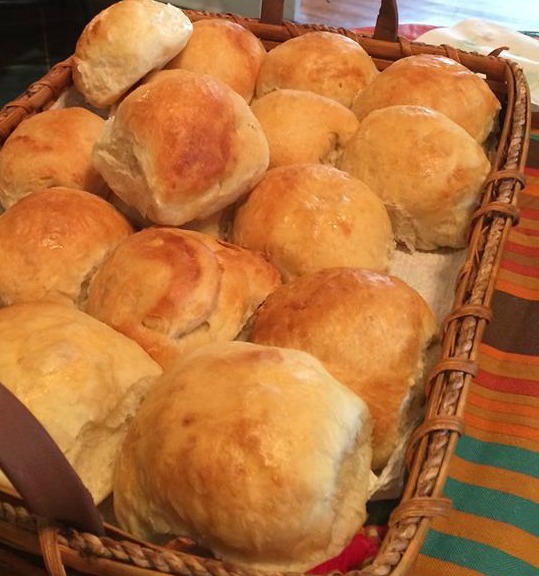 I love this recipe when I don’t have any bread or other rolls prepared for Sunday lunch. I mix it up Saturday evening and toss it into the refrigerator (well, I don’t exactly toss it, but you know what I mean). Let me give you several hints on this! 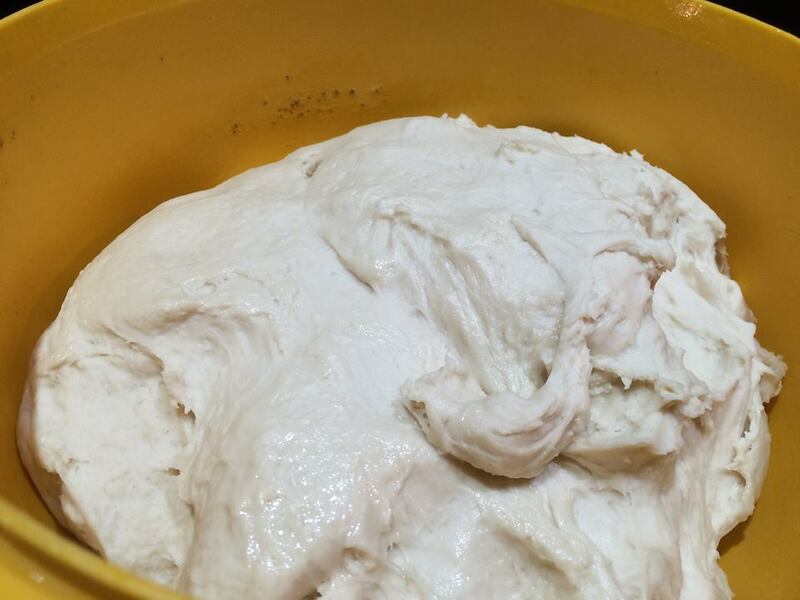 Make sure you use a bowl that is large enough to allow the dough to rise a little. (It will blow the lid off and spill onto your refrigerator shelves. 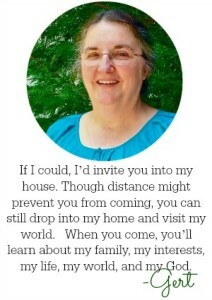 Ask me how I know!). A bowl double the size of the dough works well. Put the lid on tightly. I’m sure you can imagine why. Put something heavy on top of the lid. Something like a gallon of milk turned on its side so it will fit on that shelf. The extra weight reminds the lid that it is to stay put no matter how much pressure it receives from down below. 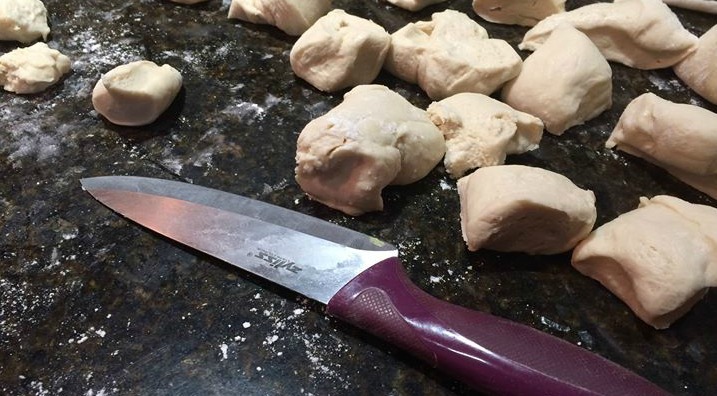 Because the dough will be stiff and cold in the morning, you can actually put it on the counter and cut it with a good knife. That way you don’t have to twist and turn and pull to get the dough divided into smaller pieces, especially if your hands are stiff and sore. I’ve done this, and I can’t tell any difference in the rolls. Put them on a greased baking sheet (or pan). Leave enough space between the rolls so they can spread out as well as up. For the bread, you’ll need all-purpose flour instead of bread flour – which is especially nice if your bread flour supply is low. Warm water, yeast, sugar, salt, shortening and an egg round out this recipe. The dough will be a little sticky, so you’ll want to toss some flour on the counter when you’re ready to roll the dough into balls. Woops. 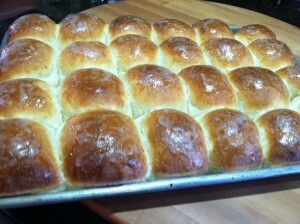 My OCD hadn’t kicked in yet or these rolls would be in a straight line. Then pop them into the oven to bake. I always brush some butter on the tops when they come out of the oven. After that, have somebody find a basket and plop the rolls into the basket. Enjoy! 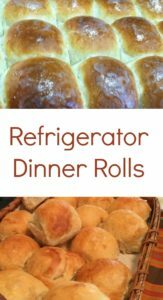 The nice thing about these rolls is that you can serve them fresh out of the oven even though you've mixed them up the day before. Mix 2 cups flour, sugar and salt, then add the yeast/water mixture. Add egg, shortening, and the remaining flour to form a soft dough. Put dough into a greased bowl, turning to grease all side of the dough. Cover with lid and refrigerate overnight. Punch down and turn onto lightly floured surface. Separate into 24 rolls and roll into balls. Cover and let rise until double - 2-3 hours. Bake at 400 for 12-15 minutes or until nicely browned. Grease tops with butter or margarine. This recipe comes from Taste of Home. Find more great recipes at www.tasteofhome.com.